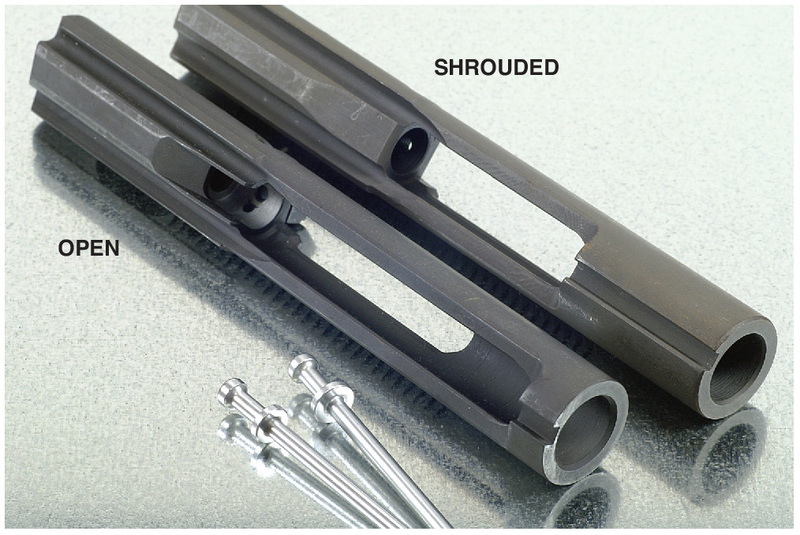 Those looking to go “premium” when building or finishing an AR-15 often look at an upgraded bolt carrier group. The primary functioning part in that group is the bolt assembly. The carrier body, as long as it is true USGI-standard specification, will give reliable and correct service. Sure, plated premium carriers are nice, mostly because they clean up much easier. Likewise, a higher-dollar carrier won’t make or break your gun, but a sub-standard bolt might. Don’t want this action! I use machinist’s drill bits to quick-check bolts: 1/16-in. (0.0625) and #53 (0.0595). If the first fits the firing pin hole, find another bolt. If the #53 won’t go, use that bolt with confidence. There’s an even dozen parts in an AR-15 bolt assembly (I count the firing pin and it’s 13 with the firing pin retainer). That doesn’t matter, well, not immediately, but there’s a few too many to thoroughly cover in this one article here. Half of those parts deserve—sometimes demand—attention, and some have options. As said for the carrier, we need a bolt that’s true USGI-standard in specification. The trick is knowing that’s what you’re getting. Parts made by genuine contractors are some assurance. Bolts are most usually made from Carpenter 158 steel, but 9310 is considered the premium material because it has a higher tensile strength. Bolts are heat-treated, and, that’s a process that needs to be done correctly. We should be getting correct when we spend up for a higher-dollar part. 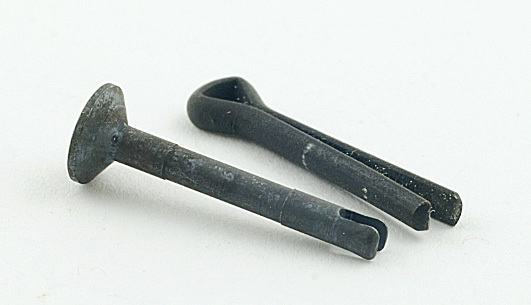 Use the large-collar firing pin only in a shrouded bolt! A small-collar works fine in either open or shrouded. I am very particular about firing-pin hole size. I will not accept one that’s too big. Blueprints call for a 0.058-inch-diameter firing pin hole. If the hole is bigger than that, then the primer gets weaker and weaker in its puncture resistance, aka: pierced primer. That’s where there’s a little hole in the center of the primer, through which hot, gritty gas has shot through the receivers and possibly into your eye through the charging handle slot. Pierced primers are not caused by excessive cartridge pressure. True, if you’ve got a setup that’s piercing primers then the only way to resolve it is to lower the propellant charge, but a primer should not pierce—it can flatten, crater, crack, blow slap out, but not pierce. An overly large firing pin hole allows for too much primer backflow, turning the hole into a cookie cutter. It’s all about surface area. 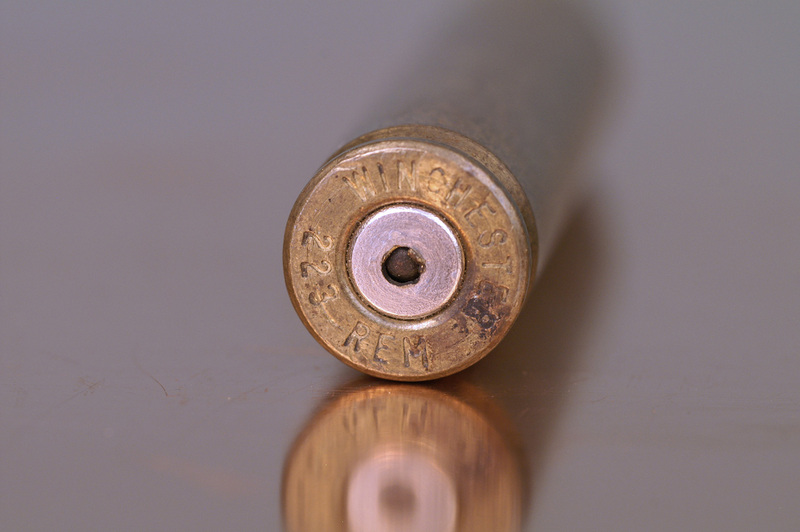 The fit between firing pin tip and firing pin hole has zero to do with it. The best resolution to pierced primers is to get a bolt with a correctly-sized hole. I’ve measured many, from various sources and variously priced, and I’ll put a cap of 0.062 on the upper limit. I’ve seen some that were 0.065 and even bigger. Understand that this may not matter until we’re exploring the upper limits of ammo pressure potentials. The bolt carrier has zero influence on headspace. That’s all in the bolt. 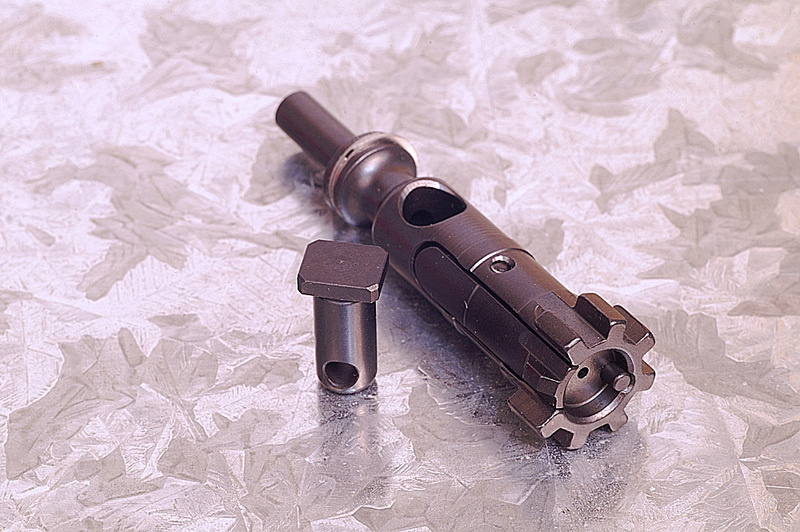 A bolt carrier can be swapped without concern. A bolt swap, though, should be checked for headspace using a gage set. Tolerances are pretty tight on true mil-spec parts, but what should be, and what is, don’t agree with certainty. Get gages here. (Make sure you know if you need .223 Rem. or 5.56 NATO, not interchangeable.) Simple: closes on a GO but not on a NO-GO it’s good to go! Reverse those and the headspace is either too short or too long. You don’t need a FIELD gage (that’s only to inspect well-worn barrels). Get the right firing pin. There are two: large collar and small collar (otherwise each is dimensionally the same). Large collar is for M16-configuration carriers (shrouded firing pin recess); small collars are for AR-15-format carriers (open firing pin recess), and will work also in an M16-configuration. However, do not use a large-collar pin in an open AR-15-style carrier! Damage to the pin will result. The collar is supposed to catch the hammer and prevent firing if the carrier is not fully forward when the hammer releases. This can happen if the hammer is riding the carrier back. If you put a large-collar pin in an un-shrouded carrier, then it can catch on the hammer notch because it’s exposed. 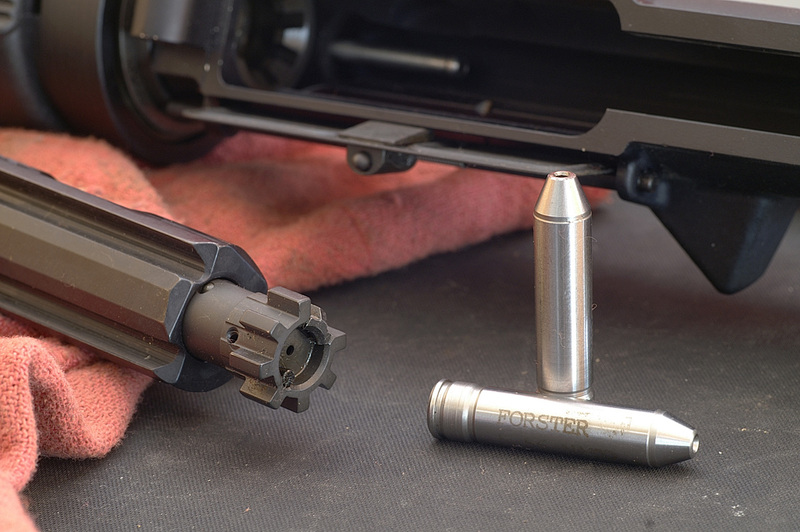 The smaller collar on the AR-15 pin was engineered so that the hammer will only catch on the collar if it’s free of both the disconnector and the primary sear. Another firing pin detail is its protrusion, or maximum amount the pin tip can extend above the bolt face surface. Get a baggie-full of firing pins and start inspections and you’ll see differences… Honestly, unless you want to buy a premium firing pin (these are, in my experience, machined with close and consistent tolerances), it’s pretty much a hit-miss process to solve an issue. Specs call for 0.028-0.036 protrusion, and there are gauges (or careful use of a caliper can show it also). A pin with excessive protrusion will, in fact, weaken a primer. I said that primer pierces are set up by the bolt firing pin hole diameter being excessive, and that’s true, but an over-poke doesn’t help. Additionally, and even though it’s not supposed to, the free-floating firing pin can and will “tap” off the primer when the bolt slams home. The firing pin collar won’t always catch on the hammer like it’s designed to do, especially with some aftermarket triggers that may have different architecture. This is inertia-induced. As such, a combination of a heavy carrier, stout buffer spring, and a firing pin with excessive protrusion can tap hard enough to step up to “strike” status and a slam-fire (out-of-battery discharge) can happen. Those are dangerous, to say the least. Here’s a really good bolt! Bravo Company. It’s been proofed, magnetic-particle-inspected, and, before all that, precisely machined and heat-treated. 9310 steel. It’s also had an extra-power extractor mod (very necessary on short-barreled guns). A part like this settles the mind, or my mind at least. Clearly, the primer cup composition has a lot to do with its level of sensitivity. The bolt cam pin gets some abuse, especially running higher-pressure ammo. There’s not really any fitting or tuning or the like that can or needs to be done, but I have replaced them because they get beat. There’s no safety worries in swapping this part for another. I usually look for a plated cam pin because they better resist wear. Grease is wise. The bolt has an ejector and spring, extractor and spring. I replace the springs with aftermarket chrome silicon (CS). Reasons: CS will endure millions of cycles and is (far) less prone to breakage. Breakage is heavily influenced by heat, and CS is more resistant to high temperature. CS also provides more spring and improved function. Note: There’s a whopping lot more to discuss on these two parts, extractors and ejectors, so look for another article soon. All the way at the back of the bolt are three gas rings. They won’t last forever. If one fails, it breaks—or that’s the cause of the fail. These work the same as piston rings: they’re there to reduce the flow forward, into the bolt, of burnt gases. They have zero function in centering or even supporting the back of the bolt. Now, I really can’t say when to replace them. There are clues. One is seeing more grunge building up in the carrier recess. Another is by simply noting a change in the resistance of pulling the bolt forward and pushing it back, as is done during maintenance. If it’s moving at very low effort, the rings are done. There is a solution to retainer woes! KNS, famous in my world for making high-quality small parts, makes a solid retainer, which is a copy of the original Armalite part from way back. They work, all the time, every time. Firing pin retainers have, in my experience, hit the skids. It’s used and reused dozens and dozens of times, and that’s because it has to get pulled to take the bolt apart, and, of course, replaced to get the bolt carrier group ready for reuse. It’s a simple part, pretty much a glorified cotter pin, and I have encountered a rash of both factory-installed and OEM replacements that will not reinstall. Out of a recently purchased bag of 12, I had 7 that worked. I stone down the leading edges to polish and smooth them for easier re-entry, and in doing so have noticed that a number are not parallel or equal-length, or both. If the arms aren’t straight as a unit (parallel so the two ends can come “together” to form a point), or if one arm is longer than the other, it may not re-enter. And, it’s not possible to bend them back into alignment; I’ve tried that a dozen different times and ended up trash-canning every one. Note: Another bolt-related issue is running alternate cartridges in AR-15s, and a big part of that is getting the bolt face and extractor architecture to suit the new round, and that, too, will be another article coming soon. It’s important! Do you have a specific bolt you prefer to run in your AR-15? Which model and why? Share your answers in the comment section. This article is a specially adapted excerpt from Glen’s brand-new book: America’s Gun: The Practical AR-15. Click to visit the Zediker Publishing website. Glen Zediker is the owner of Zediker Publishing, and specializes in books and other publications focused primarily on AR-15s and Handloading. Glen has worked professionally with some of the greatest shooters on the planet, as well as leading industry “insiders.” And he does pretty well on his own: Glen is a card-carrying NRA High Master and earned that classification in NRA High Power Rifle using an AR-15 Service Rifle. Visit http://www.ZedikerPublishing.com and learn more, plus articles for download.